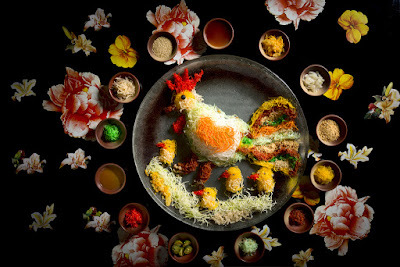 From 10 January to 11 February 2017, Golden Peony will celebrate CNY 2017 with their new and innovative dishes, being put together by Executive Chinese Chef Ku Keung and his team. In welcoming the year of Fire Rooster, Chef Ku Keung and his team prepared the Jumbo Yu Sheng of Fortune 3D Fiery Rooster Yu Sheng with Kanpachi, Abalone, Salmon and Crispy Fish Skin (创意立体鱼生). Priced at the auspicious $888, this yu sheng can feed up to 30 pax and more. Definitely one of the dish to order when you have a big group coming to dine. The combination of Kanpachi, Abalone and Salmon provided the natural freshness from the sea, while the crispy fish skin plus the fried golden pouch add to the crunchiness and texture of this dish. A very well-curated Yu Sheng and delicious indeed. The standard size of Yu Sheng also available. Priced from $68 for small (2 – 5 pax) and $128 for large (6 to 10 pax). Price will depends on additional ingredients you want to add to your treasure. Signature Roast London Duck (招牌伦敦鸭) - $80 for whole. Using the Irish Silver Hill Farm duck that made popular in London. It is meaty and succulent. The fats below the duck skin is minimum, however it is enough to retain the moistness of the meat and create the yumminess. 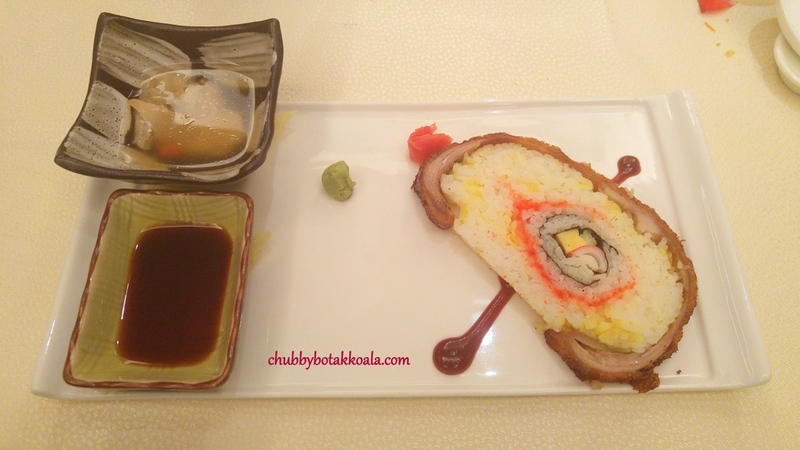 Braised Sea Cucumber stuffed with Minced Shrimp and Pork (龙船酿海参) - $88 for 2 to 4 pax. A crunchy and moist sea cucumber absorbs the delicate thick gravy nicely. The mince shrimp and pork patties, give this dish a contrasting texture than the sea cucumber. Braised Premium South African Abalone (红烧五头南非青边鲍鱼) - $78 per pax is served together with the sea cucumber. Both seafood made a perfect pairing, as the abalone also absorbs the braising liquid nicely. If you give a me a bowl of warm rice to go with this dish, I will polish up the gravy. Stir-fried Broccoli topped with Scallop and Egg White (赛螃蟹西兰花) - $38 for 2 – 4 pax. A very light dish design to showcase the quality of the scallops. Unfortunately, the dish came after the strong flavoured braised sea cucumber, making it feels like lack lustre dish. Typhoon Shelter Golden Half Lobster with Spiced Almond Flakes (避风塘开遍龙虾) - $38 per pax. Bi Feng Tang style of cooking is made popular in Hong Kong with flower crabs. Good for cooking seafood, the double deep fried seals the juice in the meat and coated it with a light golden crispy batter. The lobster meat has a crispy coated exterior with QQ and juicy interior. The spiced almond flakes add a touch of seasoning to the dish. Yum Yum. Whole Roast Suckling Pig with California Maki (创意寿司全体乳猪) - $338 for whole pig. One of the mainstay dish in the Golden Peony Chinese New Year menu. This year, the piggy is stuffed with California Maki. 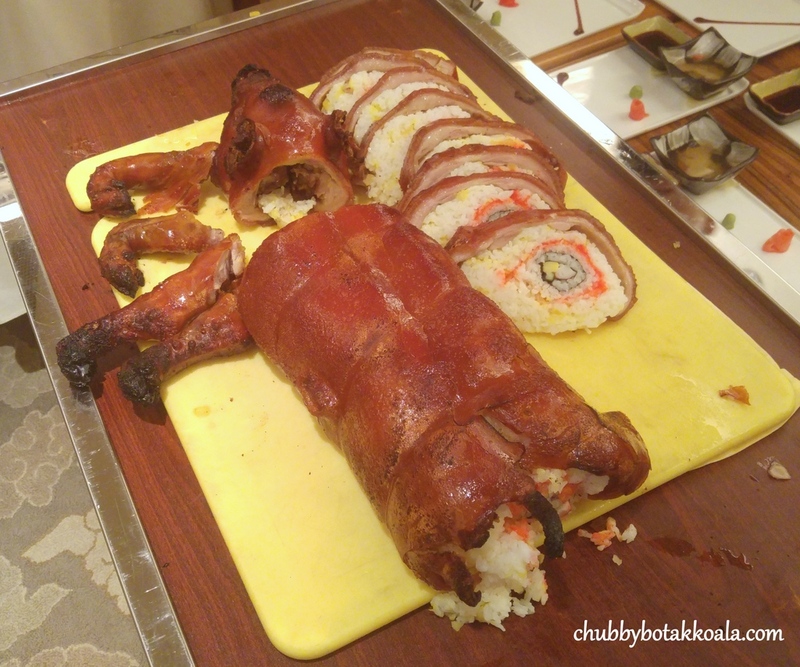 The skin is thin and crispy, while the flavours of the suckling pig infused into the stuffed rice. One of the dish that I look forward when dining here. Desserts are Golden Egg Bird’s Nest Jelly (燕窝蛋中蛋) - $28 per pax; served with Fried ‘Nian Gao’ with Sweet Potato and Yam (步步高升 – 发财年糕). The plating of the desserts is absolutely beautiful. The egg shaped bird nest jelly served on top of candy floss. Recreating the feeling of bird eggs in a nest. As the bird nest jelly has a lighter flavour, I suggest you finished the bird nest jelly before you start with the sweet candy floss. The Fried 'Nian Gao' with Sweet Potato and Yam remain delicious as ever. 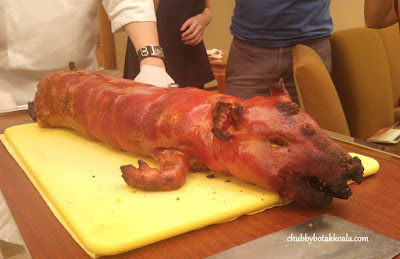 A must have dessert during the Chinese New Year with its auspicious meaning. Overall, Golden Peony continuous creativity in presenting its Chinese New Year dish is definitely something to look forward to. The Yu Sheng, Braised Sea Cucumber, Bi Feng Tang Lobster and Suckling Pig stuffed with California Maki are just delicious and memorable. Definitely a place to consider to celebrating CNY 2017. Cheers!! The CNY Menu and Brochure are available here. Thank you very much to Conrad Centennial Singapore for the tasting invitation.